So far, we know one event skin, too. Continuing on from the chain of major reveals so far this weekend, Riot Games posted another Roadmap video on Nexus, the game dev’s official editorial platform for League of Legends. The past two roadmap videos posted by Riot each focused on different parts of the game, with the first being for champions and the second being for the game’s lore. Today’s, however, focused on skins and events—and one of the biggest reveals of the video was for this year’s VS event, which, in our opinion, is the best one Riot has ever done. And yes, we know the event isn’t actually out yet. We just know it’ll be the best one ever, because instead of huge, philosophical battles between chaos and order or darkness and light, this year’s is about something far superior: Dogs vs. cats. Well, frankly, we’re sold. It mentioned cats and it mentioned dogs. What more could you want, honestly? It also unveiled what appears to be one of the event’s skins, although it didn’t reveal anything else. The skin in question is for Fizz, and, if you’ve seen the video, it’s probably self-explanatory what the skin is. We’re guessing Puppy Fizz, or something along those lines. Each VS event so far has included two skins, one for each side. 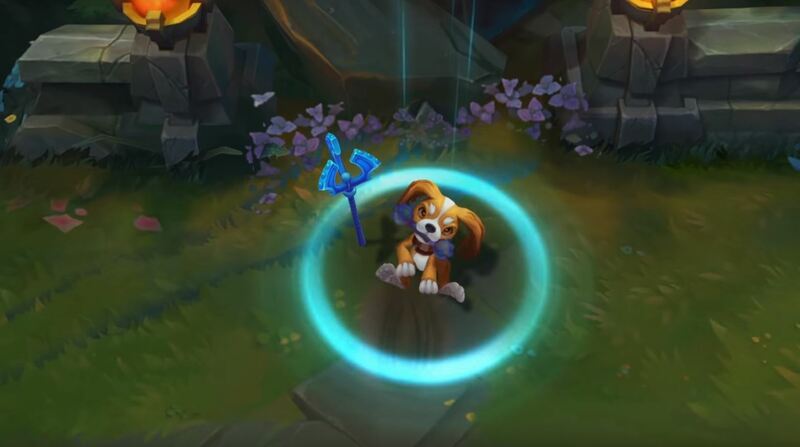 Assuming this won’t be different in that regard, which it very well could be, that would mean this is the skin for the dog side of the battle. That being said, we can now speculate wildly on what the other side will get. Maybe this is the year we’ll finally get Crazy Cat Lady Yorick. We can dream.